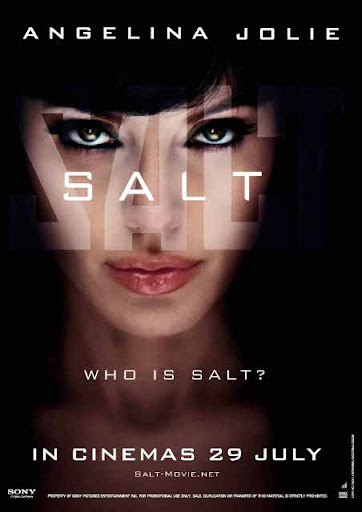 Salt is an American action thriller film directed by Phillip Noyce, written by Kurt Wimmer and Brian Helgeland, and starring Angelina Jolie, Liev Schreiber, and Chiwetel Ejiofor. Jolie plays Evelyn Salt, who is accused of being a KGB sleeper agent, and goes on the run to try to clear her name. Just finished watch SALT the movie, 2 days before premiere in Malaysia (All thanks to Nuffnang =D) So what do I feel about the movie? 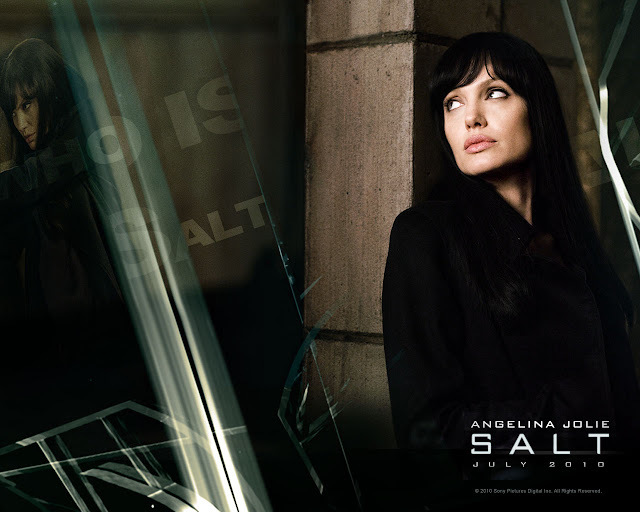 Evelyn Salt (Angelina Jolie) try to clear her name after being accused as a Russian Spy. She is a well trained person in the movie. Overall, I would rate this movie 7/10 as most of the policeman in the movie are a bit too weak to capture Agent Salt. With just a few punch and kicks can knock out those fella already. Maybe because the story was supposedly designed for Tom Cruise (who initially secured the lead). There is one of the funny scene where agent salt become a guy without "moobs". Salute for the high tech rubber+makeup + super tight bandage on her. You guys must watch the movie to see the "man" side of Angelina Jolie. Robb and Zach was there to give us SALT Movie Tickets. As usual, Nuffnang badges are love-formed on the table. There were tons of people lined up early to get SALT Limited Edition Merchandize (SALT Snowy Beret, SALT Lenticular Notebook, SALT Hidden Travel Pouch). Had dinner with Wern, Nicole Chua (MsXeroz), Jackie Loi and some Nuffies (Nicholas Chay, Jestina Goon and MichelleZyenn) @ McD. Fallen Angel aka Soo Wei Siong won the 1st prize which is a Limited Edition Salt Laptop Backpack worth RM 250. You can read Wei Siong's winning blogpost here. Hint: If you wanna win one of the movie merchandize. Men's Health Magazine July Issue has the contest~! I believe there are lots more magazine that have this contest/giveaway. So how does it looks like on Agent Salt Pepper? Would you believe if I tell you the SALT sunglasses will somehow transform you into someone else (like you see in Sailormoon)?It would be a super good mimic tool for a spy right? How do you feel about the design? I feel it tends to looks feminine instead of unisex, especially when looking at the side frame. It does looks awesome on my Little Blue Kido Daruma which won through SmashpOp's Giveaway. Let see what I am going to do with it in future. Thanks again Nufnang~! Psst~~! 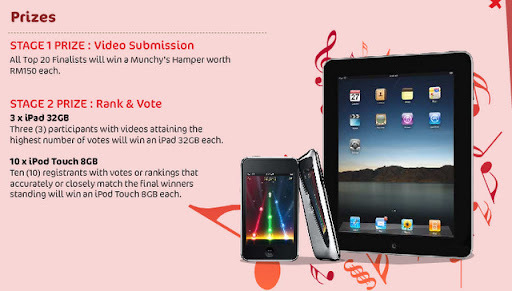 I am sharing an awesome contest that can help you own a new iPad 32GB and iPod Touch 8GB! 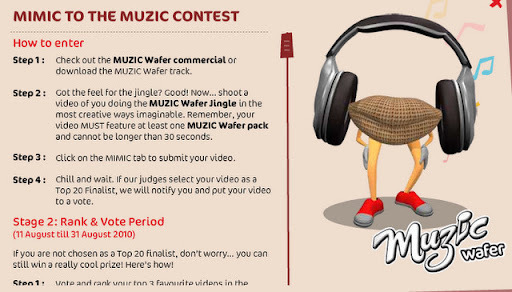 To enter the contest, all you need to do is shoot a video of you doing the Muzic Wafer Jingle in the most creative way. PS: Remember to feature at least one Muzic Wafer pack in the video without exceed ng 30 seconds. 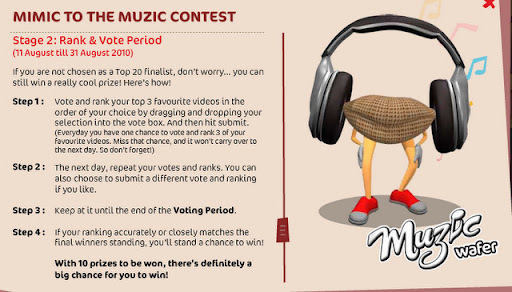 All top 20 finalist's videos will be available for vote starting from 11 Aug 2010. So, be quick! 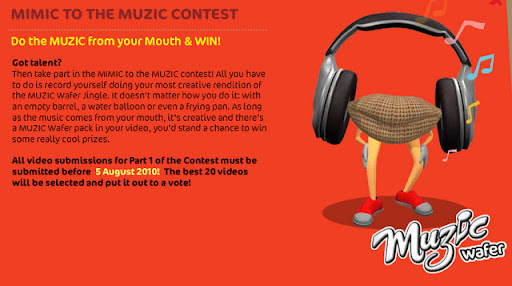 Submit your Muzic video not later than 5 Aug 2010. For more info please visit www.munchysmuzic.com. Congraz on the winning. The sunglasses look like spy. lol! Wheee I saw my video on ur blog, paiseh paiseh. CongratZ bro. Nice Sunglasses but not nice if you wear it. Tak kena with your face. I think you should give it to me..wakakakaka..